Summary: There are many opinions about the appearance and nature of Satan. Who is Satan really, and how did he become the Enemy? Satan was originally an illustrious, majestic angel called Lucifer—“the light bearer.” The NIV calls Lucifer the "Morning Star," in Isaiah 14:12, but this is an error with modern translations. Morning Star is a name for Jesus, and we should never give Satan that honor. The word Lucifer comes from two Latin words meaning "light bearer." Lucifer bore God's light while he was in heaven, shining brightly for a time, but he gave it up and entered instead into utter darkness. 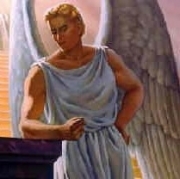 Lucifer was a powerful angel in heaven with an exalted position. He was the “anointed cherub that covereth.”. He was over all the angels and occupied a very high position radiant with light, but never over God’s throne. He was very beautiful and had a beautiful voice. He led the choirs of heaven (Ezekiel 28:12-14). But because Lucifer was proud of his beauty, he came to indulge the desire for self-exaltation. He chose himself over God, initiating the rebellion that still rages on today. Isaiah says, “For thou hast said in thine heart, I will ascend into heaven, I will exalt my throne above the stars of God: I will sit upon the mount of the congregation…I will ascend above the heights of the clouds; I will be like the most High” (Isaiah 14:13-14). Lucifer chose himself over God, initiating the rebellion that still rages on today. The devil is no theological abstraction or distortion of the mind. The devil is a personal being, able to assail unsuspecting individuals. He had a personal encounter with Christ in the wilderness. John also writes of the spirit of Satan entering into Judas’ heart when he betrayed Jesus (John 13:27). “Your adversary the devil, as a roaring lion, walketh about, seeking whom he may devour” (1 Peter 5:8). The devil is a deceiver, even working miracles to achieve his aims (Revelation 16:14). He transforms himself into an angel of light (2 Corinthians 11:14). He is a power warring against God’s people (Ephesians 6:12). The only way to overcome him is through God’s help. We must use “the sword of the Spirit, which is the word of God” (Ephesians 6:17). “Resist the devil, and he will flee from you” (James 4:7). “They overcame him by the blood of the Lamb, and by the word of their testimony” (Revelation 12:11). We are in the midst of a great war between Christ and the devil, but we are not left to battle alone. God’s plan was always to bear the consequences of sin Himself. He became sin for us, so that whoever believes in Him can be saved. The next article discusses more about the fall of Lucifer and the origin of sin on Earth. i. Carlyle B. Haynes, Satan, His Origin, Work and Destiny, (Nashville: Southern Publishing Associates, 1920). ii. Ewald Plass, What Luther Says Volume 1, (Concordia College, 2006).